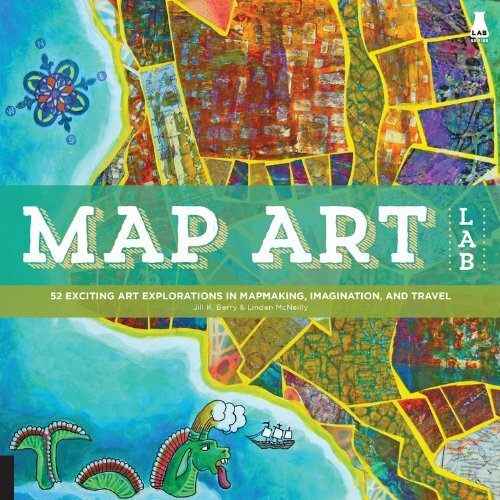 Map Art Lab is a fun art activity book for those interested in art and cartography. The 52 projects included involve mixed media, and uses all the different elements of the map to create art. You'll get to draw sea monsters like olden day maps, create all sorts of interesting looking roads, make a pop-up map, a tea-stained treasure map, satellite map of your house and many more. In many cases, you're not making an actually usable map, but a piece of art that's inspired by maps. Some of the projects would require you to collect glass tiles or stones to make a mosaic map, or have a camera or sketchbook in hand and look out for map-like creations from nature, many projects involve drawings, some collages, and other interesting ways to create art. There's a good variety of art inspired projects. It's a very hands-on book, recommended to art and craft lovers. This is absolutely gorgeous. I can't wait to get my hands on Map Art Lab!